Joseph Delgado is my new hero. 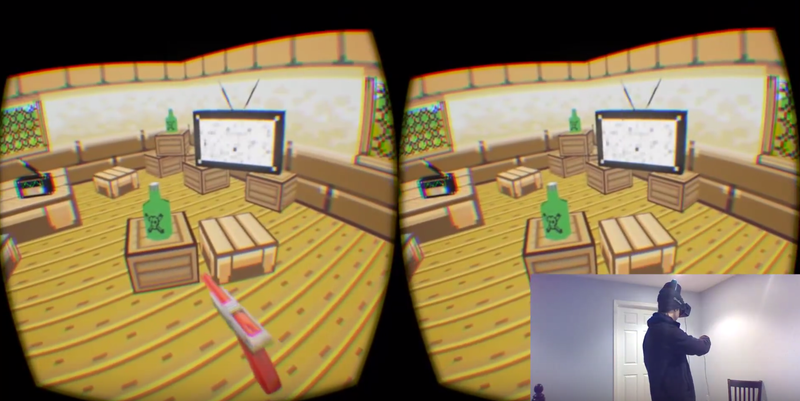 The 21-year-old computer science student at the New Jersey Institute of Technology, took his Oculus Rift Development Kit 2 and morphed the 8-bit NES classic into a virtual reality adventure. It looks super fun. The development process sounds relatively simple, too. Delgado converted the 2D sprites into 3D models with a Python script. The grey-and-orange NES Zapper is replaced by the VR handset Razer Hydras for the controller, though that iconic plastic gun still appears as your in-game weapon. Leaving the Hydra’s base station on a desk screws with the accuracy and response time of the controller though, so Delgado 3D-printed a headmount and stuck the base on his head. He made the game for Global Game Jam 2016, a sort of round-the-world hackathon for game developers. Delgado also tweaked the gameplay so that it’s a seven-day challenge, and each day, the ducks get faster and the game gets harder. He even made an original hub world that you access in between days that tells you your goal for the day. It’s also got a TV on static and is filled with empty liquor bottles you can practise shooting on. Delgado commented on YouTube that he plans on releasing it for free, and will probably port it to HTC Vive when it comes out. Read more about his process behind making the game on his blog. Joseph, are you taking requests? Can you do Metroid next, please?